^ "Canada's CF-18 Hornets". CBC News. 2011-03-21. ^ "Federal responsibility in nuclear attack alerts is unclear". Star-Advertiser. Honolulu. Associated Press. January 17, 2018. Retrieved January 18, 2018. ^ Wu, Nina (January 17, 2018). "State education department addresses missile scare". Star-Advertiser. Honolulu. Retrieved January 18, 2018. ^ a b c Schaffel, Kenneth (1991). Emerging Shield: The Air Force and the Evolution of Continental Air Defense 1945-1960 (45MB PDF). General Histories (Report). Office of Air Force History. ISBN 0-912799-60-9. Retrieved 2011-09-26. ^ Sturdevant, Rick W (1995). "Chapter 7: The United States Air Force Organizes for Space: The Operational Quest". In Launius, Roger D. Organizing for the Use of Space: Historical Perspectives on a Persistent Issue (Report). AAS History Series. Volume 18. Univelt for the American Astronautical Society. ISSN 0730-3564. ^ Weeden, Brian C; Cefola, Paul J. Computer Systems and Algorithms for Space Situational Awareness: History and Future Development (PDF) (Report). SWFound.org. Retrieved 2012-09-02. ^ a b Del Papa, Dr. E. Michael; Warner, Mary P (October 1987). A Historical Chronology of the Electronic Systems Division 1947-1986 (PDF) (Report). Retrieved 2012-07-19. McNamara…reasoned that Soviet missiles could eliminate air defense systems in a first strike ... the policy that emerged [sic] embraced the most extreme option: massive retaliation, popularly referred to ... as mutual assured destruction (MAD). ... 1966…NORAD ... 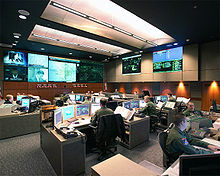 Combat Operations Center ... integrated several distinct systems into a single workable unit to provide the NORAD Commander with the necessary information and control to perform his mission. ... the Space Defense Center combining the Air Force's Space Track and the Navy's Spasur. ^ "Chapter 1: Air Defense Doctrine and Procedures". U.S. Army Air Defense Digest, 1972. Hillman Hall, Fort Bliss, Texas. 1972. North American Air Defense Command. Retrieved 2012-09-19. 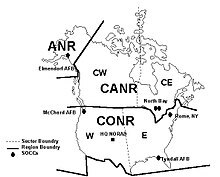 Currently, the North American Continent is divided into eight regional areas (fig 2) of air defense responsibility· Each region commander is responsible to CINCNORAD for all air defense activity within his designated area. … The average number of unknowns in the system has steadily declined over the years until now the number is approximately 40 per month. 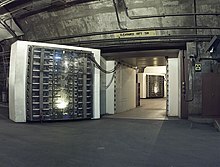 ^ "Cheyenne Mountain Upgrade (CMU)". FY97 DOT&E Annual Report (webpage transcription of chapter) (Report). Retrieved 2012-09-09. CMU also upgrades and provides new capability to survivable communication and warning elements at the National Military Command Center (NMCC), U.S. Strategic Command (USSTRATCOM), and other forward user locations. CMU additionally provides at Offutt, AFB an austere backup to Cheyenne Mountain ballistic missile warning. … Granite Sentry provides a Message Processing Subsystem and a Video Distribution Subsystem, and it upgrades the NORAD Computer System display capability and four major centers: (1) the Air Defense Operations Center, (2) the NORAD Command Center, (3) the Battle Staff Support Center, and (4) the Weather Support Unit. Granite Sentry also processes and displays nuclear detection data provided from the Integrated Correlation and Display System. ^ Winkler, David F; Webster, Julie L (June 1997). Searching the Skies: The Legacy of the United States Cold War Defense Radar Program (Report). U.S. Army Construction Engineering Research Laboratories. Retrieved 2012-03-26. ^ "Cheyenne Mountain Complex". 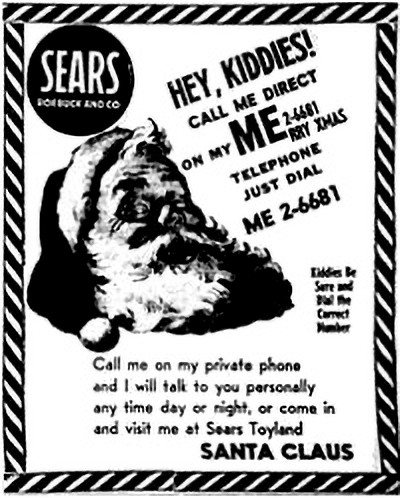 NORAD Public Affairs. AWC [Air Warning Center]. Archived from the original on 2012-10-05. Retrieved 2012-09-09. ^ D'Agostino, Davi M (21 May 2007). Defense Infrastructure: Full Costs and Security Implications of Cheyenne Mountain Realignment Have Not Been Determined [GAO--07-803R] (PDF) (Report). United States General Accounting Office. Retrieved 2012-09-09.